Heat oven to 350°F (325°F for dark or nonstick pan). Spray bottom only of 8- or 9-inch square pan with baking spray with flour. In medium bowl, stir topping ingredients until crumbly, using hands if necessary. Sprinkle evenly over batter in pan. Bake 31 to 37 minutes or until toothpick inserted in center of cake comes out clean. Cool at least 30 minutes before serving. Serve warm or cool. Store loosely covered. If you plan to tote this cake to a picnic, bake it in a disposable foil pan. Then you don't have to carry home the dirty pan. 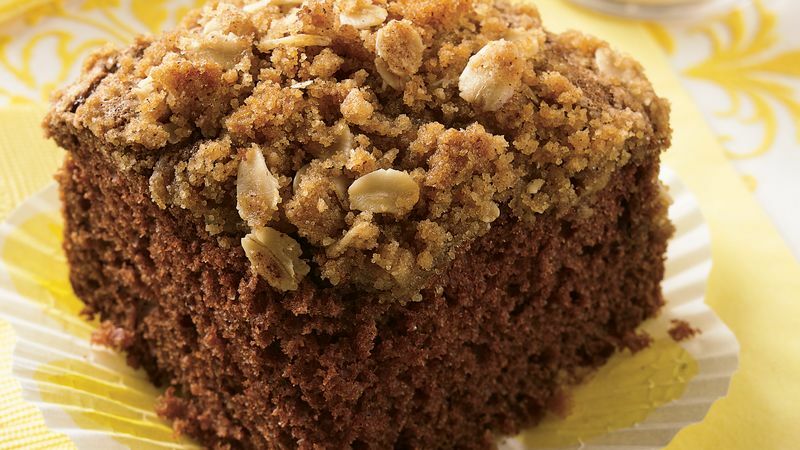 For an oatmeal-chocolate chip topping, cool cake 10 minutes; sprinkle with 1/3 cup miniature chocolate chips.